Owner and founder Kam, at the Horton Toy location in San Diego, California. Established in 1985, the family owned business has been providing quality and dependable service to the community for over two decades. We pledge to do what is best for our customers and strive to provide the absolute best service in the business. Welcome to ezToys, the leading online retailer for specialized model collectible products! We are committed to providing you with top quality model collectibles, from commercial airliners to military planes. 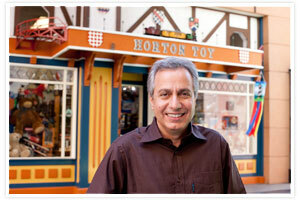 ezToys was founded in 1999 by Kam owner of Horton Toy in California. He recognized the demand for model collectibles after two decades of retail experience and after partnering with his son Yashar, ezToys was launched. Since then, this strong family team has expanded to become the premier model collectible retailer in the world. ezToys is founded on the principle of always doing what is best for our customers. We strive to provide the absolute best service in the business. Our pledge is constantly upheld through our efforts at improving our service and taking pride in delighting and satisfying our customers. From all of us at ezToys - Thank you and we look forward to doing business with you!